HERNDON, Va. - June 19, 2017 - PRLog -- REAN Cloud, a global Cloud Systems Integrator and Premier Consulting Partner in the Amazon Web Services (AWS) Partner Network (APN), has recently achieved four new AWS competencies in Education, Security, Storage and Microsoft Workloads. 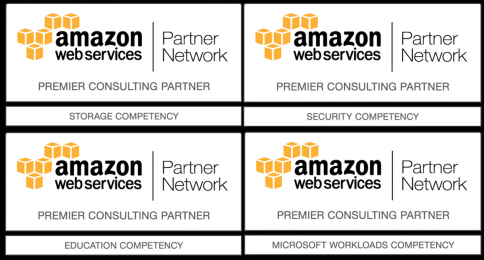 These four are added to the five AWS competencies the company had already earned in Financial Services, Life Sciences, Government, Migration and DevOps. In order to gain each competency, REAN Cloud has had to demonstrate that it not only possesses deep expertise and experience with the AWS platform, it has had to deliver solutions in each of the areas mentioned seamlessly in the AWS Cloud environment, providing specialized consulting services and helping enterprises adopt, develop and deploy complex projects on AWS. REAN Cloud earned AWS Security Competency status in multiple security consulting categories: Governance, Risk, and Compliance and Security Engineering. This highlights the company's strength, depth and expertise in areas of security and compliance – including FedRAMP security standards – and recognizes that REAN Cloud has already helped many customers with various aspects of IT governance, regulatory and compliance standards at scale. To achieve AWS Storage Competency status, AWS requires that an APN member possesses deep domain expertise in one or more of the following core storage categories – Backup & Recovery, Primary Storage, Archive, or Business Continuance/Disaster Recovery (BCDR). Having developed innovative technology and solutions that leverage AWS services, REAN Cloud differentiates itself by exhibiting the required expertise in all of them. "Demonstrating our command of multiple categories for both AWS storage and security really helps cement REAN Cloud's status as one of the most skilled premier AWS consulting partners," said Dan Connolly, EVP of REAN Cloud's Customer Business Group. "In particular, as one of the very first APN members to earn the AWS Storage Competency, we take pride in helping enterprises realize the full benefits of AWS Cloud storage." It was important for REAN Cloud to gain the AWS Microsoft Workloads Competency because many data centers run on Microsoft technology. Achieving this competency demonstrates how REAN Cloud excels in analyzing and managing Microsoft workloads – with a specific focus on workloads based on Microsoft Database Solutions – for large enterprises. "A majority of data centers run on a version of Windows so in order to be considered a top choice to help leading companies migrate Microsoft-based apps to the cloud it was crucial to achieve the AWS Microsoft Workloads Competency," said Sekhar Puli, Managing Partner at REAN Cloud. Achieving the AWS Education Competency differentiates REAN Cloud as an APN member that has successfully delivered its customers specialized solutions aligning with AWS architectural best practices to support the academic experience of teachers and learners and/or improve the operational needs of administrators. This designation recognizes that REAN Cloud has demonstrated technical proficiency in building solutions that support mission-critical workloads for education customers of all types: higher education, K-12, research and publishing. "Educational institutions are a great fit for REAN Cloud's portfolio as we are very comfortable working in highly regulated industries such as financial services, the public sector and healthcare," said Sri Vasireddy, Managing Partner at REAN Cloud. "The AWS Education Competency highlights our commitment to provide our education customers with the same kind of bimodal IT managed services we provide for our enterprise customers." Achieving the four new competencies is just one way REAN Cloud has been recognized for its cloud expertise. Earlier this year REAN Cloud was included in the Gartner Magic Quadrant for Public Cloud Infrastructure Managed Service Providers and more recently the company was named to CRN magazine's 2017 Solution Provider 500 List. REAN Cloud, a global Cloud Systems Integrator (CSI) and Managed Service Provider (MSP), is a Premier Consulting Partner in the Amazon Web Services (AWS) Partner Network (APN). REAN Cloud offers managed and professional services and solutions for hyperscale integrated IaaS and PaaS providers and is one of few MSPs capable of supporting the entire cloud services lifecycle. Backed by extensive security DNA and deep compliance IP and expertise, REAN Cloud specializes in helping enterprise customers operating in highly regulated environments – Financial Services, Healthcare/Life Sciences, Education and the Public Sector –to get the most from their cloud investment while enabling them to accelerate the value gained from the cloud once there. REAN Cloud's team has worked with global organizations including the American Heart Association, Alexion Pharmaceuticals, Ditech Mortgage, Ellucian, Globus Genomics, Philips, PierianDx, SAP, Symantec, Teradata and Veritas. REAN Cloud solutions are bundled with advanced security features to help address clients' compliance needs.